A catastrophic explosion rocked the island country of Cyprus in 2011. Approximately 100 containers holding explosives ignited. The results were devastating – 12 people lost their lives. It also took out a local power station and injured another 60 people. As this incident demonstrates, improper storage of ammunition and explosives can be detrimental. What is an Explosive Storage Magazine? Closing magazine doors should make their hinges inaccessible. Secure hinges by welding, riveting or bolting with the nuts on the inside of the door. Protect locks with ¼-inch steel hoods to prevent sawing. Each door must include two mortise locks, two padlocks (with five tumblers or casehardened shackles) or a combination of both. Three-point locks are also acceptable. Lighting must meet NEC or NFPA 70-81 to prevent sparks inside the magazine. Cover interior walls with non-sparking material. Metal edges and doors must overlap sides by at least 1 inch. Wall construction varies according to the type of storage and the material of construction. Details are available in the standard itself. U.S. Chemical Storage manufactures and supplies magazines for explosive and ammunition storage. All magazines meet and exceed ATF 27 CFR, Part 555.208 and DoD 5100, along with International Fire Code, International Building Code and National Electrical Code. While standard sizes are available, we can also customize magazines to your requirements. Mining and quarrying are major industry users of explosives. Their need for regular receipt, storage and use of explosives requires strict safety protocols to prevent catastrophic incidents and injuries. The military is a large-scale user of ammunitions and explosives. Military bases must take care to preserve safe distances between explosive storage magazines. Standards dictate safe distances based on the type of explosives involved and the type of construction of the magazines. Construction and demolition sites also use explosives regularly. Always use the correct type of explosive magazines to satisfy the local authorities. U.S. Chemical Storage manufactures and supplies ammunition and explosive storage magazines. We meet ATF codes to provide peace of mind about the safety of your stocks. 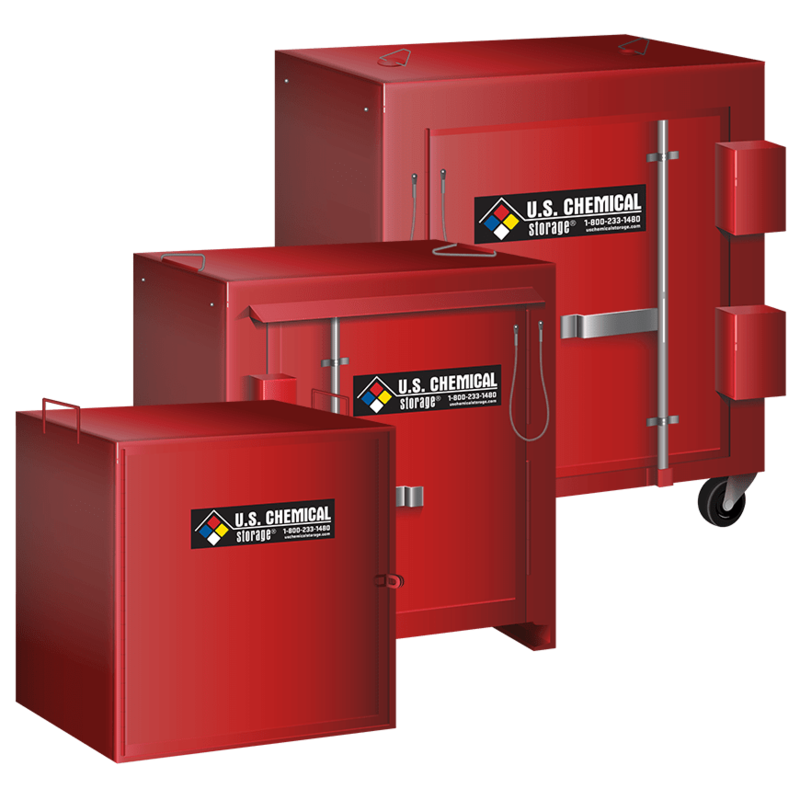 Find out more about our standard models here or contact us for a custom explosive storage magazine for your needs.